January is an interesting time of year. Many of us begin the month reflecting on the 12 months that came before, and thinking about how to make the next 12 even better. What’s really happening is a transition from one place and time to another. Being mindful of it is important… after all, transition is a defining element of the human experience. Both in our personal and professional lives, the moments that shift one to another can offer the greatest tests, and the greatest lessons. In fact, the actual power of transition is what we can learn from it. Capital Electric is looking at a big year of transition – including a move to a new corporate headquarters. This feels like the perfect time to pause and look at who we have been as a business, and where we want to go from here. Immediately, the piece that stands out is our extreme dedication to customer service. My dad built this business on a foundation of sincerity, generosity, and support. I’m happy to say that regardless of the address on our business card, that commitment to real and positive relationships remains the same. We recently had a great honor when one of our longtime customers retired; he couldn’t leave without sharing this incredible affirmation with us: “It was 23 years of great service. 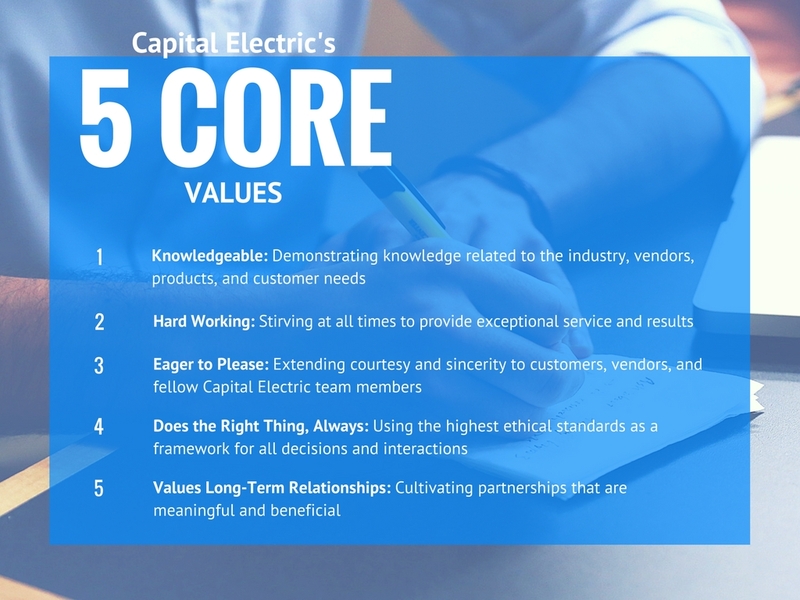 Many times all I did was describe what I needed and Capital Electric was able to suggest a product that exactly fit the bill.” Believe me when I say that this captures the essence of who we are – then, now, and always! I could not be more grateful to this gentleman for extending that compliment, or more proud of the entire team who made it possible. As we prepare for the transition ahead, I want to share our 5 Core Values with you. In more everyday terms, these values are expressed in our tagline: At Your Service. This is so much more than three simple words; it is a call to action, and the heart of our business. Past, present, and future – connecting with our customers is always the most important job we will ever have.